Day 268 / Hat 268: Trucker-style cap with red foam front and white mesh back with printed circular patch detail with blue embroidery around border. Patch includes white silhouette of the state of Texas against a red background with a blue star. 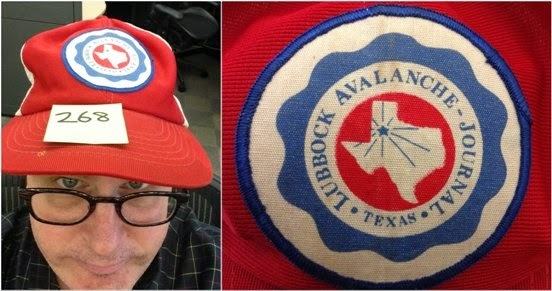 Words surrounding it read: "Lubbock Avalanche-Journal." The sophomore piece of headgear from Los Angeles Times Food section editor Russ Parsons' BOH (that's "bag o' hats," don't forget),who tells me that the LAJ was the first newspaper he worked at after college -- from 1979 to 1981. "I covered high school sports -- for towns like Muleshoe and Punkin Center," he told me, "and I covered country music." Reminds me of my days back at the Manchester (Vermont) Journal. While I never covered country music, we did have a running joke about a moose in the boiler room. We were curious about the name of the paper -- as Lubbock didn't strike us as a particularly avalanche-prone part of the U.S. -- and according to the Wikipedia entry about the paper (which was founded in 1900 by by John James Dillard and Thad Tubbs), "the name "Avalanche" was chosen due to [Dillard's] desire that the newspaper surprise the citizens of Lubbock." So a second hat-tip to Russ for the loaner lid - and a peek back toward the early days of his 35-year career slinging ink and pixels.